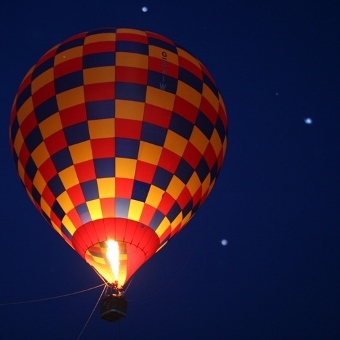 Why do balloons mostly fly early morning? How long is the balloon flight? How many passengers are there in the balloon? Can some people not fly in a hot air balloon? 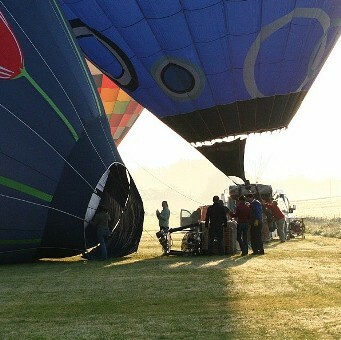 In the early morning conditions are best for ballooning as the air is cool and stable from the night. During the main part of the day the sun reflecting from the ground heats the air above causing thermal activity and bubbles and pillars of rising air. These thermals cause unstable air which makes it difficult to control the altitude of a hot air balloon. 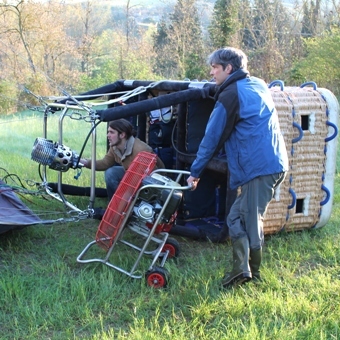 We schedule hot air balloon rides in Tuscany all year round depending mainly on weather conditions. Our balloon flights usually take place in the early morning shortly after sunrise, but this changes depending on the season and time of year. A hot air balloon ride with us, the actual flight time lasts for around one hour depending on weather conditions and suitability of landing sites; The whole ballooning tour takes approx. two to three hours. Our usual balloon launch field is situated in Tuscany a few minutes drive South of Florence. The nearest town is San Casciano in Val di Pesa. We have several launch sites in and around Florence, Siena, Lucca and other locations in Tuscany and throughout Italy. The hot air balloon travels with the wind currents, you never know where exactly you’re going to fly over and where precisely you’ll be landing.. which makes it a little adventure every time! The pilot will start looking for suitable landing sites towards the end of flight and the retrieve crew will follow the balloon on the ground with the 4×4 car and trailer and arrive on site shortly after landing. After the balloon is packed away and the Prosecco is finished.. we’ll transport you back to the initial meeting point. Sometimes when visibility is exceptionally clear we may go up to 4-5000 feet depending also on airspace restrictions; When we fly near Florence there are some restrictions and we must stay below 2500 ft. but even at a few hundred feet the views are incredible. Flying really low, touching the tree tops is something you can only do with the hot-air balloon. Hot air balloons do not have a rudder and can not besteared in the normal sense, so they travel with the wind. The pilot does control the altitude by heating and cooling the balloon. How far we fly depends on the wind speed and direction which will determine the time it takes the pilot to find a good landing field. Some days we fly a relatively short distance other days many miles.. The balloon basket does not have wheels.. so sometimes when there is wind on the ground, on landing the balloon basket can tip on an angle and drag along before coming to a halt. This is perfectly normal and for many it is the most favorite part of the flight. The balloon baskets are designed for safety and comfort, during landing you will be in the safe landing position as instructed by your pilot. We recommend passengers should wear flat and comfortable shoes (waterproof shoes are best as grass is often damp in the early morning), shoes with high heels are not allowed on board. Do wear layers of clothes, it is often quite cool early morning. 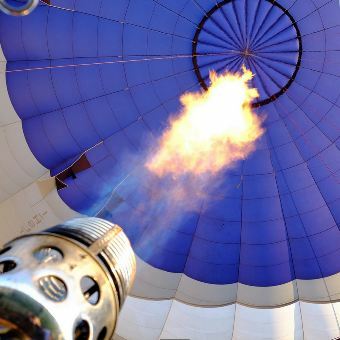 Possibly, wear a hat or cap for the radiant heat of the balloon burners. During the flight temperatures are about the same as those on the ground. Generally clothes suitable for a walk in the country which you don’t mind getting a little dirty. Of course you should bring a camera, the balloon is the most perfect platform for aerial photography. However cameras are carried at your own risk. 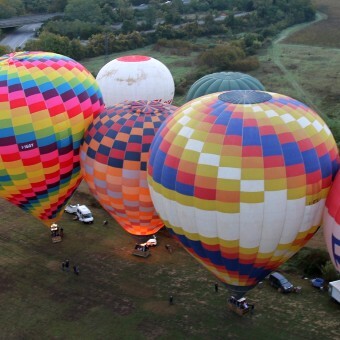 We operate a fleet of balloons varying in size. 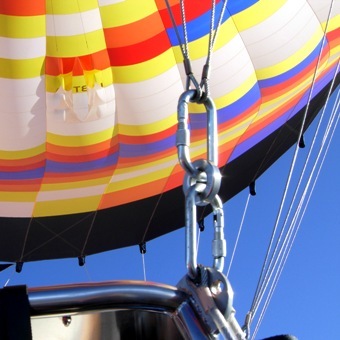 Our standard balloon rides use baskets which carry 4, 6 up to 8 people. We also have a balloon for groups carrying 16 passengers, where the balloon basket is devided into compartments with between two and four people in each compartement (with the pilot in the central compartement), so you have your own space. We also have smaller balloons which accommodate just to passengers and the pilot for our exclusive Privilege flights. Children must be tall enough to see over the edge of the basket and minors must be accompanied by e relative. Passengers must be physically able to climb over the side into the basket with the steps provided, stand unassisted for an hour and adopt the seated landing position. Passengers should also be sure they don’t have any pre-existing medical conditions which could be affected by the ballooning experience and seek medical advice if unsure. As a general rule, people should be able to jump from the height of a chair without difficulty. People weighing over 110kg will be required to pay a supplement. We can not fly passengers who are pregnant or who have recently had major surgery. 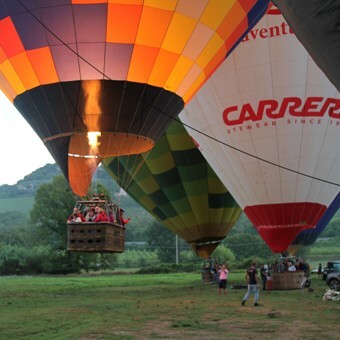 Hot air ballooning is an extremely safe activity which is highly regulated and controlled in Italy. We follow strict safety guidelines and update courses and use the best ballooning equipment. Our pilots are highly experienced professionals. We do not hesitate to cancel a flight if the weather is not suitable. We are insured for public and third party. Hot air ballooning is very weather dependent and occasionally pilots will cancel a flight because the weather conditions are not suitable. This can be because of strong winds, poor visibility (fog), possibility of thunder storm activity and rain or very wet ground conditions. The pilot will take the decision to fly based on the most up to date forecasts available. Sometimes the actual conditions may be different to what was forecast. The pilot will always put safety first, the decision to fly is solely at pilots discretion. 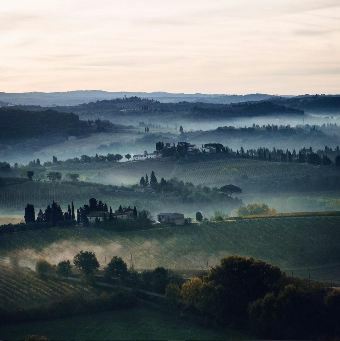 If we have to cancel your flight because of weather or other reasons outside of our control, we will try to re-schedule your flight during your stay in Tuscany. If there is no other possible day, we will cancel your booking, in this case there is no charge; No flight – no charge. You can cancel up to 30 days before the flight date there is no charge. If you cancel within the final 30 days up to 72 hours before a 25% cancellation fee applies. If you cancel within 72 hours before the flight you will be charged 100% cancellation fee. Don’t forget – ballooning is a weather dependent activity, if the flight has to be cancelled and cannot be re-arranged at your convenience then there is no charge, no cancellation fee.